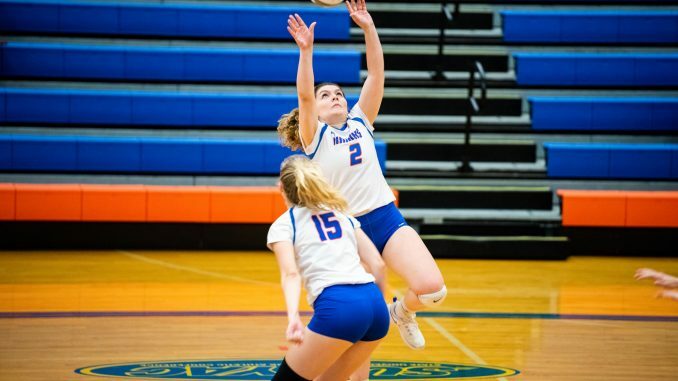 For only the third time this season, the State University of New York at New Paltz women’s volleyball team did not complete a weekend sweep. The Hawks earned a 3-0 (25-14, 25-19, 25-13) win over Lasell College Friday in the Skidmore College Invitational, while losing twice Saturday to Morrisville State College and Skidmore College, 3-2 (19-25, 9-25, 25-17, 29-27, 16-18) and 3-1 (19-25, 25-17, 10-25, 15-25), respectively. The weekend ends New Paltz’s regular season with a 24-8 record. The Hawks will now look forward to the State University of New York Athletic Conference (SUNYAC) tournament, where they hold the second seed at 8-1 in conference play. Jumping out to a 6-2 lead in the first set against Lasell, New Paltz was determined to bounce back from the loss to Vassar College in its last match. When the Lasers pulled within three early, a kill by third-year middle hitter Kerri Neville started a four-point run for the Hawks, putting momentum back on their side with a 12-5 lead. New Paltz continued to score thoroughly, extending its lead to as much as 12 and never allowing Lasell to come behind by less than five within the rest of the set. The Hawks took a 1-0 advantage, 25-14. Allowing the Lasers to gain a 5-2 lead in the second, a bad set allowed New Paltz to tie the set at nine. A kill by third-year outside hitter Madison Van Pelt started a eight-unanswered point run for the Hawks, taking back the set at 17-9. With New Paltz up 22-12, Lasell attempted a come back, fighting until the end to come within six at 23-18. The effort was not enough, as the Hawks went up 2-0 with a second set win, 25-19. After New Paltz gained an early lead in the third, the Lasers fought back to tie the set at eight. A service error by Lasell led to two service aces by second-year setter Haley Timarky, topped off by another Van Pelt kill, to put the Hawks up 12-8. At 12-9, a Van Pelt kill caused another run for New Paltz, as multiple bad sets by the Lasers gave the Hawks a 16-9 lead. New Paltz finished the match off strong, winning, 25-13. Allowing Morrisville State to gain a 5-0 lead in the first set the next day, New Paltz never found a way to take back the lead. Falling behind 17-9, a Neville kill finally got the Hawks offense going, sparking a 8-2 run to come within two at 19-17. It was not enough, as the Mustangs answered with a 6-2 run of their own to take the set, 25-19. Morrisville State’s offense was ruthless in the second set, scoring with ease to gain a 21-3 advantage. New Paltz did not back down, going on a 6-1 run themselves, but the Mustangs’ effort was too much. Morrisville State won the set, 25-9, fully putting momentum on its side up 2-0. The Hawks were not ready to go down in straight sets, and came out in the third with a 10-0 run capped off with two kills by second-year outside hitter Julie Greenspan and one by Herasme. Boosting their lead to 22-10, the Mustangs made a come-back to cut the gap to six, but New Paltz prevailed and took the set, 25-17. The fourth set was back-and-forth, featuring 18 ties throughout, as both teams never fell behind by more than three. Tied at 27, a block by both Herasme and Greenspan, and a fourth-year outside hitter Taylor Cimillo kill, put the Hawks back in the game, tying the match at two. Trying to keep their composure, Morrisville State took the first jab in the fifth set, gaining a 4-0 lead. A timeout by Coach Giufre proved vital, as a Cimillo kill started a six unanswered-point run for New Paltz, coming back at 6-4. Neither team fell behind by more than three in another back-and-forth set. The Hawks went up 15-14 in the fourth after a Cimillo kill, but the Mustangs fought to gain the lead back at 16-15. A service error tied the score at 16, but Morrisville State’s effort was greater, as an attack error by New Paltz and a kill gave the Mustang’s the set, 18-16, and the win in a tight match. Falling down early again in the second set against Skidmore, the Thoroughbreds came out with a 6-2 lead. When the Hawks came back to tie the set twice at seven and at 10, Skidmore answered with 7-0 run, taking the lead, 17-10. A 5-1 run got New Paltz within four at 22-18, but the streak was quickly shot down by the Thoroughbreds, as they took a 1-0 lead after winning the set, 25-19. Bouncing back, a kill by Van Pelt pushed the Hawks lead out to 7-2 in the second. When Skidmore tied the set at seven, New Paltz continued to score with vigor, never giving up the lead again to play their best set of the match. The Hawks tied the game at one, with a 25-17 set win. The loss ignited Thoroughbreds, as they thoroughly scored against New Paltz in the third set. Skidmore won the set, 25-10 and took a 2-1 lead over the Hawks. New Paltz could not come back from the tough set loss, falling down to the Thoroughbreds 9-4 to start the fourth. A 9-3 run by Skidmore boosted the home team ahead to 19-9, and was enough to put the match away. The Thoroughbreds won the set, 25-15, and the match, 3-1. Racking up 87 assists throughout the tournament, fourth-year setter Meredith Dignan was named to the All-Tournament team for the weekend. The Hawks will begin their postseason run Nov. 2, when they face SUNY Oswego.